The crew from Simon Construction of Waterford began installing the last wildlife culvert on the Long Point Causeway earlier this month. 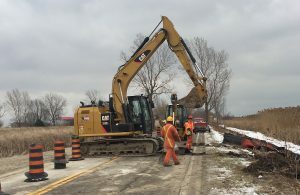 Port Rowan, ON (Jan. 16, 2017)– Construction of the last of the 12 culverts planned for installation along the Long Point Causeway is underway this week. 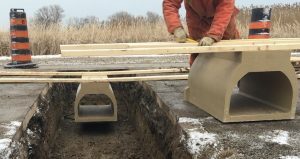 Another small terrestrial culvert was installed by Robert M. Simon Construction Ltd., of Waterford, in December under the same contract with Norfolk County. As well, a large aquatic culvert was built by Bre-Ex Construction Ltd., of London, in November and about 1,200 metres of exclusion fencing was installed by local contractor Steve Armstrong. All work was done on the section of the Causeway north of Big Creek. Altogether, the construction and related activities such as engineering services, project management and channel dredging will cost about $640,000 and is being entirely paid for with funding raised by the Long Point World Biosphere Reserve Foundation. Since the project began 10 years ago, the LPWBRF has raised more than $2.7 million for ecological improvements along the Causeway. This year’s funding has come from Environment Canada’s National Wetland Conservation Fund and Habitat Stewardship Program for Species at Risk, the US National Fish and Wildlife Foundation’s Sustain Our Great Lakes program, Ontario’s Species at Risk Stewardship Program and the Canada-Ontario Agreement on the Great Lakes. Some of the planned work has been delayed due to the onset of winter weather but will be completed as soon as weather conditions allow. A worker prepares one of the prefabricated culvert sections for installation in the roadway. The culvert sections are then encased in concrete. The project’s annual road kill monitoring last summer confirmed the 2015 finding of a reduction of nearly 80 per cent in the number of turtles and snakes killed on the Causeway since the work began in 2008. Since then, nearly six kilometres of exclusion fencing and nine terrestrial and three large aquatic culverts have be installed along the 3.6 kilometer road. The fencing prevents wildlife from climbing onto the road while the culverts provide safe passage under it. The aquatic culverts also restore water connections between the Big Creek Marsh and Long Point Bay. The Long Point Causeway Improvement Project was initiated and is managed by a steering Committee (LPCIPC) comprised of representatives from 12 local organizations and government agencies and several individuals well-known in the community. The LPCIPC receives financial and administrative support from the Long Point World Biosphere Reserve Foundation, which has promoted research, monitoring, education and projects that support the goals of conservation and sustainable use in the Biosphere Reserve since 1986. © 2016 Long Point Causeway Improvement Project. Site by Guardian Computing.